For the most part we are a cell phone using family. They are convenient and with having a Smartphone it’s useful for so many things. It’s easy to carry because I can just slip it in my pocket when I am on the go. But I am always not on the go and I do not carry my phone with me all the time. So when I heard that we were getting a VTech Handset Connect to Cell™ Answering System with Cordless Headset. This cordless phone setup does way more than just provide a wireless land line. 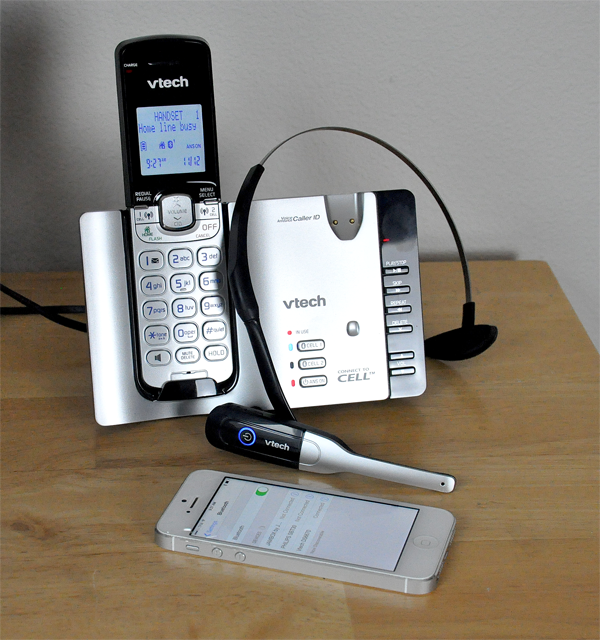 This phone connects up to 2 different Bluetooth capable cell phones to our VTech DS6670-6c home phone system. When I am home I use my home phone for making calls because sometimes I just don’t know where my cell phone is so this allows me to use my home phones to answer and take calls from my cell phone. On the handset is your typical HOME (call) call and OFF buttons but there are also 2 additional buttons that are labeled “1 CELL” and “2 CELL” for each phone hooked up. So now when my cell phone rings and it’s in an entirely different part of our home I can answer it from any base I am near. And I can set different ring tones to indicate if it’s a call for home or a cell phone. The Main Unit base also features a built in answer machine system which is simple to use. No messing with trying to figure out what does what because the buttons are laid out in simple to understand symbols and labels. Plus I like a standalone message machine over the dial in voicemail systems. Sometimes I leave my cell phone in my bedroom and maybe it’s get piled under clothes, at least now I won’t miss any phone calls. 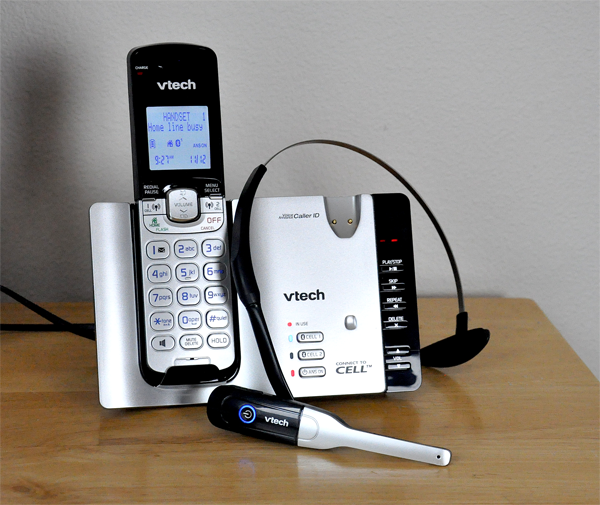 The VTech is easy to pair through its Connect To Cell feature. 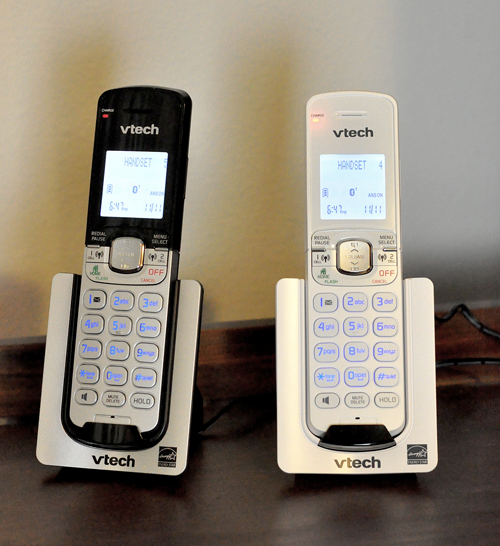 To pair a cell phone with the VTech system, hold the CELL 1 button on the base system until it flashes and beeps. Then go to Bluetooth paring on your Smartphone (we used our iPhone 5 for this pairing) and select the ‘Vtech DS6670’ device and that’s it. Setup is the same for CELL 2. The ability to connect the phone to our cell phones is great. But what is also very useful is the hands free headset. This lightweight and small headset allows us to use the phone while tending to the long list of daily activities and responsibilities around our home. Whether it’s dealing with the kids or taking a business call, this phone is the ultimate phone that seriously does it all. What else is awesome about this Phone System is it comes with 4 additional bases and handsets with 2 in a white finish and 2 in the black and silver finish. These are great to match different areas of the home plus making it easy to not have to carry one or 2 phones around an entire home. You can even forgo the landline and use this system just off of your cell phone or cell phones. Also all the extra land phones are capable of receiving the cell phone calls. After setting the time on one unit every other phone synced itself to the system, so setup was easy. This is a great phone for the busy mom like me or the business professional like me. It is also easy to import your phonebook from cell phone to home phone memory. VTech has been around making the newest wireless phones and this has to top the list for wireless phones period. This phone is just great because the ability to add in cell phones and the headset just help to bring the easy and technology of the 21st century to the home phone! You can check out and follow Follow VTech on Twitter @VTechPhones and Like VTech on Facebook. For more info or to buy your own DS6670-6C EXCLUSIVELY online at www.vtechphones.com. Originally published on 2013-11-13 by Kristin at Our Ordinary Life .